For other uses, see Al Aqabah (disambiguation). Clockwise from the left top: Aqaba's skyline, Aqaba Fort and Aqaba Fields, Al-Hammamat Al-Tunisyya Street in Down Town, Resort in Aqaba, Ayla old City, Aqaba Port, Aqaba Flagpole. 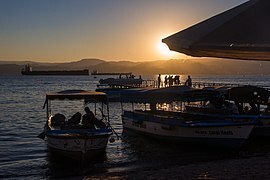 Aqaba (English: /ˈækəbə/; Arabic: العقبة‎ Arabic pronunciation: [æl ˈʕæqaba]) is the only coastal city in Jordan and the largest and most populous city on the Gulf of Aqaba. Situated in southernmost Jordan, Aqaba is the administrative centre of the Aqaba Governorate. The city had a population of 148,398 in 2015 and a land area of 375 square kilometres (144.8 sq mi). Today, Aqaba plays a major role in the development of the Jordanian economy, through the vibrant trade and tourism sectors. The Port of Aqaba also serves other countries in the region. Aqaba's strategic location at the northeastern tip of the Red Sea between the continents of Asia and Africa, has made its port important over the course of thousands of years. The ancient city was called Elath, adopted in Latin as Aela and in Arabic as Ayla. Its strategic location and proximity to copper mines made it a regional hub for copper production and trade in the Chalcolithic period. Aela became a bishopric under Byzantine rule and later became a Latin Catholic titular see after Islamic conquest around AD 650, when it became known as Ayla; the name Aqaba is late medieval. The Great Arab Revolt's Battle of Aqaba, depicted in the film Lawrence of Arabia, resulted in victory for Arab forces over the Ottoman defenders. Aqaba's location next to Wadi Rum and Petra has placed it in Jordan's golden triangle of tourism, which strengthened the city's location on the world map and made it one of the major tourist attractions in Jordan. The city is administered by the Aqaba Special Economic Zone Authority, which has turned Aqaba into a low-tax, duty-free city, attracting several mega projects like Ayla Oasis, Saraya Aqaba, Marsa Zayed and expansion of the Port of Aqaba. They are expected to turn the city into a major tourism hub in the region. However, industrial and commercial activities remain important, due to the strategic location of the city as the country's only seaport. The name of the city was anciently Elath, Ailath. The name is presumably derived from the Semitic name of the Pistacia tree. 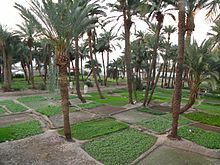 Modern Eilat (established 1947), situated just west of Aqaba, also takes its name from the ancient settlement. In the Hellenistic period, it was renamed Berenice, but the original name survived, and under Roman rule was re-introduced in the forms Aela or Haila, adopted in Byzantine Greek as Άιλα Aila and in Arabic as Ayla (آيلة). The present name al-ʿAqaba (العقبة) is a shortened from al-ʿaqabat Aylah (آيلة العقبة) "the mountain-pass of Ayla", first mentioned in the 12th century by Idrisi, at a time when the settlement had been mostly reduced to a military stronghold, properly referring to the pass just to the north-east of the settlement (29°33′32″N 35°05′42″E﻿ / ﻿29.559°N 35.095°E﻿ / 29.559; 35.095, now traversed by Aqaba Highway). Excavations at Tall Hujayrat Al-Ghuzlan and Tall Al-Magass in Aqaba revealed that the city has been an inhabited settlement since 4000 BC, with a thriving copper production on a large scale. This period is largely unknown due to the absence of written historical sources. Archaeologists from University of Jordan have discovered the sites, where they found a small building whose walls were inscribed with human and animal drawings, suggesting that the building was used as a religious site. The people who inhabited the site had developed an extensive water system in irrigating their crops which was mostly grapes and wheat. Several different-sized clay pots were also found suggesting that copper production was a major industry in the region, the pots were used in melting the copper and reshaping it. Scientific studies performed on site revealed that it had undergone two earthquakes, with the latter one leaving the site completely destroyed. The Edomites, who ruled over Edom just south of the Dead Sea, are believed to have built the first port in Aqaba called Elath around 1500 BC, turning it into a major hub for the trade of copper as the Phoenicians helped them develop their maritime economy. They profited from its strategic location at the junction of trading routes between Asia and Africa. Around 735 BC, the city was conquered by the Assyrian empire. Because of the wars the Assyrian empire had in the east, its trading routes were diverted to the city and the port witnessed relative prosperity. The Babylonians conquered it in 600 BC. During this time, Elath witnessed great economic growth, which is attributed to the business background of its rulers who realized how important the city's location was. The Persian Empire took the city in 539 BC. Roman milestone that marked the starting point of the Via Nova Traiana on display in the Aqaba Archaeological Museum. Aqaba Church, considered to be the world's first purpose-built church. The city continued to grow and prosper which made it a major trading hub by the time of the Greek rule by 300 BC, it was described by a Greek historian to be "one of the most important trading cities in the Arab World". The Ptolemaic Greeks called it Berenice. The Nabatean kingdom had a large population north of the city, the ones who had built Al-Khazneh in the city of Petra, they outnumbered the Greeks which made the capture of the city easy. One of the oldest known texts in Arabic alphabet is an inscription found in Jabal Ram 50 kilometres (31 miles) east of Aqaba. In 64 BC following the Roman conquest, they annexed the city and called it Aela (also Haila, Aelana, in Greek rendered Άιλα Aila). Both Petra and Aela were under strong Nabatean influence despite Roman rule. Aela reached its peak during Roman times, the great long distance road the Via Traiana Nova led south from Bostra through Amman, terminating in Aela, where it connected with a west road leading to Philistia and Egypt. Around AD 106 Aela was one of the main ports[clarification needed] for the Romans. It was the home origin of what came to be known as the Ayla-Axum Amphoras. By the time of Eusebius, Aela became the garrison of the Legio X Fretensis, which was moved to Aela from Jerusalem. Aela came under Byzantine Empire rule in AD 300, where the Aqaba Church was constructed, considered to be the world's very first purpose-built church. The city became a Christian bishopric at an early stage. Its bishop Peter was present at the First Council of Nicaea, the first ecumenical council, in 325. Beryllus was at the Council of Chalcedon in 451, and Paul at the synod called by Patriarch Peter of Jerusalem in 536 against Patriarch Anthimus I of Alexandria, a council attended by bishops of the Late Roman provinces of Palaestina Prima, Palaestina Secunda and Palaestina Tertia, to the last-named of which Aela belonged. According to Ibn Ishaq, Muhammad himself in the Expedition to Tabouk of 630 reached, and extracted tribute from, Aila. 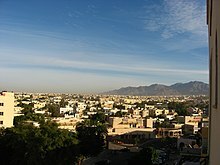 Aila fell to the Islamic conquest by 650, and the ancient settlement was left to decay, while a new Arab city was established outside its walls under Uthman ibn Affan., also known as Ayla (Arabic: آيلة‎). The geographer Shams Eddin Muqaddasi describes Ayla as nearby the ruined ancient city. The city prospered from 661 to 750 under the Ummayads and beyond under the Abbasids (750-970) and the Fatimids (970-1116). Ayla took advantage of its key position as an important step on the road to India and Arab spices (frankincense, myrrh), between the Mediterranean Sea and the Arabian Peninsula. The city is also mentioned in several stories of the Arabian Nights. The medieval city was excavated in 1986 by a team of the University of Chicago. Artefacts are now on exhibit at Aqaba Archaeological Museum and Jordan Archaeological Museum in Amman. The city was inscribed in a rectangle 170 × 145 fortified meters, with walls 2.6 meters thick and 4.5 meters high, surrounding a fortified structure, occupying an area of 35 × 55 meters. 24 towers defended the city. The city had four gates on all four sides, defining two main lines intersecting at the center. The intersection of these two channels was indicated by a tetra pylon (a four-way arch), which was transformed into a luxury residential building decorated with frescoes of the tenth century. This type of urban structure, called MSIR,[clarification needed] is typical of early Islamic fortified settlements. Baldwin I of Jerusalem took over the city in 1116 without much resistance. The center of the city then moved to 500 meters along the coast to the south, and the crusader fortress of Helim was built, as well as Pharaoh's Island (now in Egyptian territorial waters about 7 kilometres (4 miles) west of Aqaba). The city declined in the late 12th century due earthquakes and attacks by Bedouins and Mamluks forces. Ayla remained under the control of the kingdom of Jerusalem from 1116 until 1187, when it was captured by Saladin. The settlement by this point had essentially disappeared, and the site became known after the nearby mountain-pass, as al-ʿAqaba. 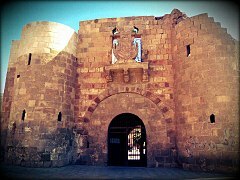 The old fort was rebuilt, as Aqaba Fortress, by sultan Al-Ashraf Qansuh Al-Ghuri in the early 16th century. For the next four centuries, the site was a simple fishing village of little importance. 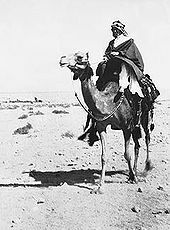 During World War I, the Ottoman forces were forced to withdraw from Aqaba in 1917 after the Battle of Aqaba, led by T. E. Lawrence and the Arab forces of Auda abu Tayi and Sherif Nasir. The capture of Aqaba allowed the British to supply the Arab forces. In 1918, the regions of Aqaba and Ma'an were officially incorporated into the Kingdom of the Hejaz. In 1925, Ibn Saud the ruler of Nejd with the help of his Wahhabi Ikhwan troops successfully annexed the Hejaz, but gave up the Ma'an and Aqaba to the British protectorate of Transjordan. In 1965, King Hussein, through an exchange deal with Saudi Arabia, gave 6,000 square kilometres (2,317 square miles) of desert-land in Jordanian territories in exchange for other territories, including 12 kilometres (7 miles) of an extension of prime coastline south of Aqaba, which included the magnificent Yamanieh coral reef. Aqaba was a major site for imports of Iraqi goods in the 1980s until the Persian Gulf War. The city lies at Jordan's southernmost point, on the Gulf of Aqaba lying at the tip of the Red Sea. Its strategic location is shown in the fact that it is located at the crossroads of the continents of Asia and Africa, while bordering Israel, Egypt and Saudi Arabia. 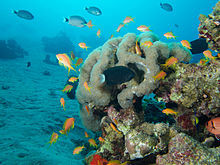 Aqaba has a hot desert climate (Köppen climate classification BWh) with a warm winter and a hot dry summer. 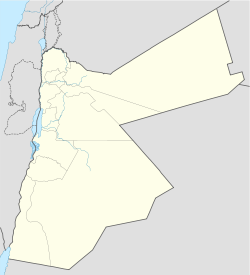 Jordan is divided into 12 administrative divisions, each called a Governorate. Aqaba Governorate divides into 3 Nahias, some of which are divided into districts and further divided into neighborhoods. While others are either villages or towns. The Red Sea Summit in Aqaba in 2003. Benefiting from its location and status as Jordan's special economic zone, Aqaba's economy is based on the tourism and port industry sectors. The economic growth in Aqaba is higher than the average economic growth in the country. Under the special economic zone status some investments and trades are exempted from taxation, as a result, new resorts, housing developments, and retail outlets are being constructed. New projects such as Tala Bay and Saraya al Aqaba are constructed aiming at providing high-end vacation and residential homes to locals and foreigners alike. Over US$20 billion have been invested in Aqaba since 2001 when the Special Economic Zone was established. Along with tourism projects, Aqaba has also attracted global logistic companies such as APM Terminals and Agility to invest in logistics, which boosted the city's status as a transport and logistics hub. There are numerous hotels that reside in Aqaba but new hotels are also under construction. Marsa Zayed a $10 billion is the largest mega mixed-use development project ever envisioned in both Jordan and the region. Marsa Zayed will host facilities including residential neighborhoods, commercial outlets and amenities, entertainment venues, financial and business facilities, and a number of hotels. Additionally, the property will feature marinas and a cruise ship terminal. Marsa Zayed will encompass 6.4 million square meters of built-up property. Saraya Aqaba, a $1.5 billion resort with a man made lagoon, luxury hotels, villas, and townhouses that will be completed by 2017. Ayla Oasis, a $1.5 billion resort around a man made lagoon with hotels, villas, an 18-hole golf course designed by Greg Norman. It also has an Arabian Venice theme with apartment buildings built along canals only accessible by walkway or boat. This project will be completed by 2017. Tala Bay, Tala Bay was developed in a distinctive architectural style that blends Jordanian and regional architecture with total cost of US$680 million. Another distinguishing feature of this single community resort is its two-kilometer private sandy beach on the Red Sea. The Red Sea Astrarium (TRSA), the world's only Star Trek themed park, worth $1.5 billion will be completed by 2014. The park will span 184 acres (74 ha) will include "technologically advanced attractions, five-star accommodation, captivating theatrical productions," and night-time spectacles. The project will include four hotels and provide 500 job opportunities in the coastal city. Port relocation. Aqaba's current port will be relocated to the southernmost part of the province near the Saudi border. Its capacity will surpass that of the current port. The project costs $5 billion, and it will be completed by 2013. Aqaba will be connected by the national rail system which will be completed by 2013. The rail project will connect Aqaba with all Jordan's main cities and economic centers and several countries like Saudi Arabia, Iraq, and Syria. The Aqaba Container Terminal (ACT) handled a record 587,530 twenty-foot equivalent units (TEUs) in 2008, an increase of 41.6% on the previous year. To accommodate the rise in trade on the back of the increasing popularity of container shipping and the stabilising political situation in Iraq, the Aqaba Development Corporation (ADC) has announced plans for a new port. The port relocation 20 kilometres (12 miles) to the south will cost an estimated $600m and will improve infrastructure, while freeing up space for development in the city. Plans for upgrading the King Hussein International Airport (KHIA) and the development of a logistics centre will also help position Aqaba as a regional hub for trade and transport. Aqaba has a number of luxury hotels, including in the Tala Bay resort 20 km further to the south, which service those who come for fun on the beaches as well as Scuba diving. It also offers activities which take advantage of its desert location. Its many coffee shops offer mansaf and knafeh, and baqlawa desserts. Another very popular venue is the Turkish Bath (Hamam) built in 306 AD, in which locals and visitors alike come to relax after a hot day. In 2006, the Tourism Division of the Aqaba Special Economic Zone Authority (ASEZA) reported that the number of tourists visiting the Zone in 2006 rose to about 432,000, an increase of 5% over previous year. Approximately 65%, or 293,000 were Jordanians. Of foreign tourists, Europeans visited the Zone in the largest numbers, with about 98,000 visiting during the year. The division has financed tourism advertising and media campaigns with the assistance of the European Union. During national holidays, Jordanians from the north, particularly Amman and Irbid, flock to Aqaba's luxury resorts and sandy beaches. During these holiday weekends, hotel occupancy reaches 100%. Aqaba has been chosen for the site of a new waterfront building project that would rebuild Aqaba with new man-made water structures, new high-rise residential and office buildings, and more tourist services to place Aqaba on the investment map and challenge other centers of waterfront development throughout the region. 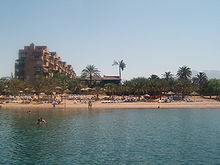 Aqaba was chosen as the Arab Tourism City of 2011. During the 5 day holiday at both the end of Ramadan and Eid Al-Adha, Jordanian and western expats flock into the city with numbers reaching up to 50,000 visitors. During this time the occupancy rate of most hotels there reaches as high as 90%, and are often fully booked. 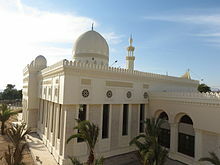 ِIslam represents the majority of the population of Aqaba, but Christianity still exists today. Approximately 5,000 Christian families live in the city. There are several churches in the city and one Christian school called Rosary Sisters School Aqaba. Residential buildings in Aqaba are made up of 4 stories, of which are covered with sandstone or limestone. The city has no high-rises; however, Marsa Zayed project is planned to dramatically change that reality through the construction of several high-rise towers that host hotels, residential units, offices and clinics. The largest museum in Aqaba is the Aqaba Archaeological Museum. Aqaba has recently experienced a great growth in its nightlife, especially during the dramatic increase of tourist number in the 2000s. The fact that the city is the only coastal city in Jordan has created a distinctive cuisine relative to other Jordanian cities. Main dishes include Sayadeyah, a combination of rice, fish and spices, a dish common among Arab coastal cities. Kishnah is fish, tomatoes and onions cooked together. Bukhari is made up of rice, meat, hummus beans, ghee and spices popular with wedding ceremonies. Aqabawi desserts include Al-Hooh, which consists of layers of pastry stuffed with nuts or dates that are then fried in ghee and dipped in sugar syrup. Dates and ghee, consisting of fresh dates dipped in ghee, is a simple dessert also commonly presented to guests. The Aqaba railway system is only used for cargo transportation and no longer functions for travelers, with the exception of the route to Wadi Rum. King Hussein International Airport is the only civilian airport outside of Amman in the country, located to the north of Aqaba. It is a 20-minutes drive away from the city center. Regular flights are scheduled from Amman to Aqaba with an average flying time of 45 minutes which is serviced by Royal Jordanian Airlines and Jordan Aviation Airlines. Several international airlines connect the city to Istanbul, Dubai, Alexandria, Sharm el-Sheikh, and other destinations in Asia and Europe. Aqaba is connected by an 8,000 kilometres (5,000 mi) modern highway system to surrounding countries. The city is connected to the rest of Jordan by the Desert Highway and the King's Highway that provides access to the resorts and settlements on the Dead Sea. 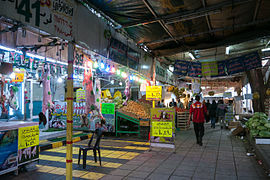 Aqaba is connected to Eilat in Israel by taxi and bus services passing through the Wadi Araba crossing. And to Haql in Saudi Arabia by the Durra Border Crossing. There are many bus services between Aqaba and Amman and the other major cities in Jordan, JETT and Trust International are the most common lines. These tourist buses are spacious and installed with air conditioning and bathrooms. The Port of Aqaba is the only port in Jordan. The Port of Aqaba is the only port in Jordan. Regular ferry routes to Taba are available on a daily basis and are operated by several companies such as; Sindbad for Marine Transportation and Arab Bridge Maritime. The routes serve mainly the Egyptian coastal cities on the gulf like Taba and Sharm Al Sheikh. In 2006, the port was ranked as being the "Best Container Terminal" in the Middle East by Lloyd's List. The port was chosen due to it being a transit cargo for other neighboring countries, its location between four countries and three continents, being an exclusive gateway for the local market and for the improvements it has recently witnessed. ^ a b "Fact Sheet". Aqaba Special Economic Zone Authority. Aqaba Special Economic Zone Authority. 2013. Retrieved 2015-09-27. ^ a b Ghazal, Mohammad (22 January 2016). "Population stands at around 9.5 million, including 2.9 million guests". The Jordan Times. The Jordan News. Retrieved 22 January 2016. ^ a b c "Port expansion strengthens Jordanian city of Aqaba's position as modern shipping hub". The Worldfolio. Worldfolio Ltd. 2015-02-27. Retrieved 2015-09-27. ^ "العقبة.. ثغر الاردن الباسم". Ad-Dustor Newspaper. Ad-Dustor Newspaper. 2013-06-21. Retrieved 2015-09-27. ^ "The Complete Guide to Lawrence's Arabia". Independent. Independent. 2004-05-22. Retrieved 2015-09-27. ^ a b "The Taking of Akaba - 1917 - T.E. Lawrence, Auda abu Tayi, Prince Feisal, Port of Aqaba". www.cliohistory.org. ^ a b "Jordan tapping popularity of UEFA Champions League to promote tourism". The Jordan Times. The Jordan News. 2015-03-26. Retrieved 2015-09-27. ^ a b "King checks on Aqaba Mega-Projects". The Jordan Times. The Jordan News. 7 June 2012. Archived from the original on 28 September 2015. Retrieved 27 September 2015. ^ a b "Aqaba has caught mega-project fever from its Gulf neighbours". Your Middle East. Your Middle East. 2013-04-29. Retrieved 2015-09-27. ^ a b Jean-Eric Aubert; Jean-Louis Reiffers (2003). Knowledge Economies in the Middle East and North Africa: Toward New Development Strategies. World Bank Publications. p. 59. ISBN 978-0-8213-5701-9. ^ Grinzweig, Michael (1993). Cohen, Meir; Schiller, Eli, eds. "From the Items of the Name Eilat". Ariel (in Hebrew). Ariel Publishing (93–94: Eialat – Human, Sea and Desert): 110. ^ The Umayyads: The Rise of Islamic Art. AIRP. 2000. p. 183. ISBN 978-1-874044-35-2. ^ Moshe Sharon (1997). Corpus Inscriptionum Arabicarum Palaestinae. 3. p. 89. ^ Yoel Elitsur (2004). Ancient place names in the Holy Land. Magnes Press. p. 35. ^ Trudy Ring; Robert M. Salkin; Sharon La Boda (1994). International Dictionary of Historic Places: Middle East and Africa, المجلد 4. Taylor & Francis. p. 72. ISBN 978-1-884964-03-9. ^ "اكتشافات أثرية في موقع حجيرة الغزلان بوادي اليتيم في جنوب الأردن". Alghad (in Arabic). Alghad. 2008-02-18. Retrieved 2016-04-22. ^ a b "First purpose-built church". Guinness World Records. Guinness World Records. Retrieved 2015-09-27. ^ Mayhew, Bradley (April 2006) . Jordan (6 ed.). Footscray: Lonely Planet. ISBN 1-74059-789-3. ^ Di Taylor; Tony Howard (1997). Treks and Climbs in Wadi Rum, Jordan. Cicerone Press Limited. p. 33. ISBN 978-1-85284-254-3. ^ "Atlas Tours". Atlas Tours. Retrieved 17 October 2011. ^ Francis E. Peters, Muhammad and the Origins of Islam, p. 241. ^ "The Oriental Institute of the University of Chicago - Aqaba Project". Aqaba project. The Oriental Institute of the University of Chicago. ^ "حفريات أثرية.. العقبة منطقة اقتصادية منذ 6 آلاف سنة". Al-Rai Newspaper. Al-Rai Newspaper. 2009-07-10. Retrieved 2015-09-28. ^ "Aqaba". kinghussein.gov.jo. kinghussein.gov.jo. Retrieved 2015-09-28. ^ Eliyahu Kanovsky (1992). The Economic Consequences of the Persian Gulf War: Accelerating Opec's Demise. Washington Institute for Near East Policy. ISBN 978-0-944029-18-3. ^ "Location". aqaba.jo. aqaba.jo. Retrieved 2015-10-01. ^ "Aseza ::". Aqabazone.com. Retrieved 17 October 2011. ^ "AFP: 'Trekkies' to boldly go to Jordan theme park". Google. 9 August 2011. Retrieved 17 October 2011. ^ "Final Ann Rep Eng" (PDF). Retrieved 17 October 2011. ^ "King visits Aqaba Special Economic Zone Authority | ASEZA ::". Aqabazone.com. Retrieved 17 October 2011. ^ "Arkia to operate flights to Aqaba – Israel Travel, Ynetnews". Ynetnews.com. 20 June 1995. Retrieved 17 October 2011. ^ "ATO: Jordan turned Aqaba into a distinguished city". Zawya. 10 February 2010. Retrieved 17 October 2011. ^ "Over 50,000 vacationers visited Aqaba during Eid Al Adha". jordantimes.com. 29 September 2015. ^ a b "DoS Jordan Aqaba Census" (PDF). Archived from the original (PDF) on 29 September 2011. Retrieved 17 October 2011. ^ "أبناء الطائفة المسيحية في العقبة يطالبون بمقعد نيابي". Al-Ghad Newspaper (in Arabic). Al-Ghad Newspaper. 2012-04-19. Retrieved 2015-09-28. ^ "Construction of a Church and Multi-Purpose Hall in Aqaba". lpj.org. lpj.org. 2010-08-20. Retrieved 2015-10-01. ^ "Raising awareness on solar energy among school students in El Aqaba governorate". NATIONAL ENERGY RESEARCH CENTER. NATIONAL ENERGY RESEARCH CENTER. Archived from the original on 2 October 2015. Retrieved 1 October 2015. ^ "Culture and Traditions". aqaba.jo. aqaba.jo. Retrieved 2015-09-28. ^ a b c "Getting to Aqaba". aqaba.jo. aqaba.jo. Retrieved 2015-10-01. ^ "Top 10 Middle East Ports". ArabianSupplyChain.com. 31 October 2006. Retrieved 31 December 2012. Mayhew, Bradley (April 2006) . Jordan (6 ed.). Footscray: Lonely Planet. ISBN 1-74059-789-3. Wikimedia Commons has media related to Aqaba. 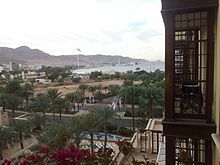 Wikivoyage has a travel guide for Aqaba. This page was last edited on 8 April 2019, at 04:43 (UTC).